This is a tutorial for jewelry making beginners. By following this tutorial, you can learn how to make simple dangle earrings in a very short time. Look for fashion pearl earrings? 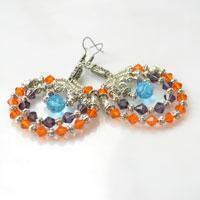 So lucky, today’s handmade beaded earring ideas would tell you how to make fashion earrings. Just check it out! 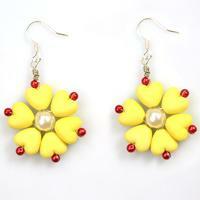 In this tutorial, I will show you a pair of yellow flower earrings to welcome the approaching spring. 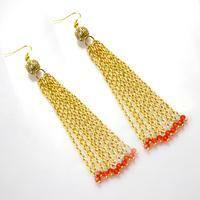 Look for long tassel earrings tutorial? 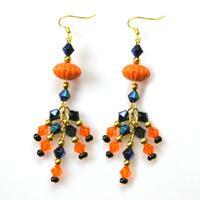 Well, today I will tell you how to make chain tassel earrings within 15 minutes. 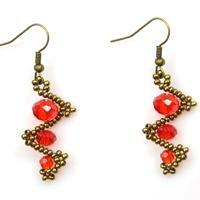 For Valentine’s Day, I want to make a couple of red beaded earrings for girls, hope you like the twist earrings. 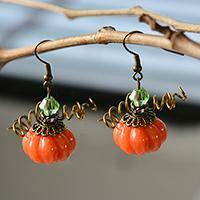 This DIY costume jewelry design will show you how to make Halloween dangle earrings with headpins and beads. Hope you will like it! How to make an ear cuff from wire? 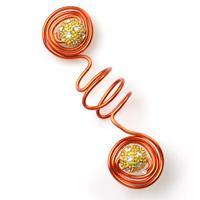 In this instruction, I will guide you DIY wire ear cuff. Look for beaded heart pattern? Well, today I will show you how to make a heart out of beads. Don’t leave! 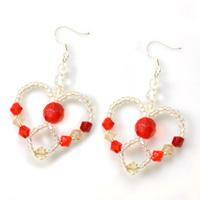 A pair of beautiful beaded heart earrings is waiting for you! 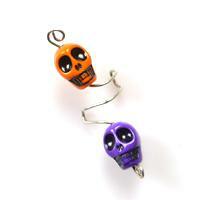 Halloween is coming, are you looking for skull jewelry? Well, this wire ear cuff tutorial will entirely tell you how to make wire skull ear cuff with skull beads. Hope you will like! 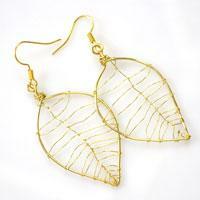 Look for leaf design earrings? Today’s tutorial will be entirely about how to make leaf earrings. It is very suitable for coming autumn. Hope you will like it! 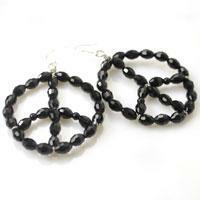 Do you want to make shamballa style earrings? Today, I will share you how to make shamballa earrings. Hope you like it! 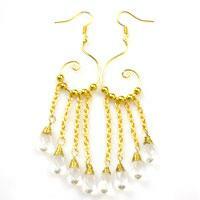 Look for diy chain link dangling earrings for wedding? 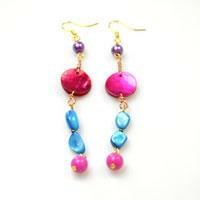 Today, I will share you how to make gold chain link earrings. The result will be fab! Want to make beaded hoop earrings at home? In today’s tutorial, I will show you how to make beaded hoop earrings step by step. Hope you will like it! Today’s tutorial is entirely about how to make large hoop earrings. To learn this pair of large beaded hoop earrings is a start in your DIY craft trip! 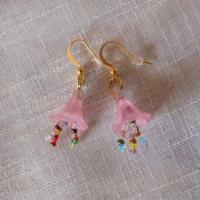 This is an easy tutorial about making a pair of flower drop earrings for summer. Girls, come on and try it! 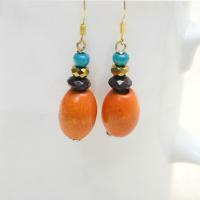 In this tutorial, I am going to show you how to make simple beaded earrings. 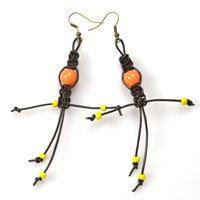 Take this pair of dangle beaded earrings away! 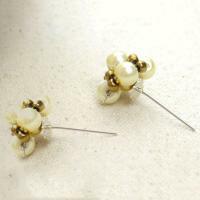 In this tutorial, you will get to know the steps on making pearl earring studs in a simple way. Via today’s project, you will see an incredible way on how to wire wrap cool hoop earrings simply. Here is the full instruction on the dangling hoop earrings I made. Hope you like them! 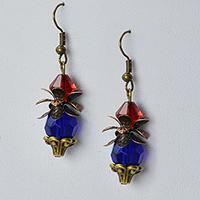 This is pair of common earrings that everyone can make. 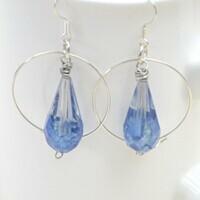 With the tutorial, you will know how to make this drop style dangle earrings.